After completing all the fun activities in the Kentucky Little Passports state journal, Trevor and I were inspired to make a horse craft. Look carefully at the face. Can you tell how we got the shape? It's a footprint! I love doing footprint crafts with Trevor. It's so much fun looking back on his older projects and comparing how tiny his feet were to how big they're getting now. We made our horses using the same technique we used to make pandas 5 years ago. (Trevor looks SO little in those photos!) 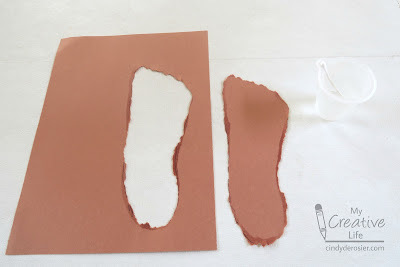 To make your own footprint horse, you need cheap construction paper (the cheaper the better), a q-tip, twine, and glue. Use a pen to trace your footprint on brown construction paper, then go over the line you drew with a wet q-tip. If you have really poor quality construction paper, one time will do. 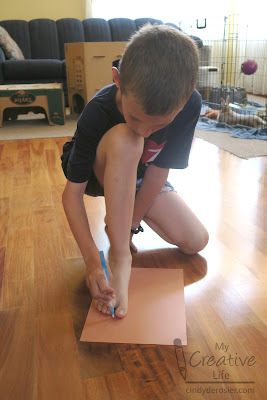 If you have better quality construction paper, trace the line a second time. 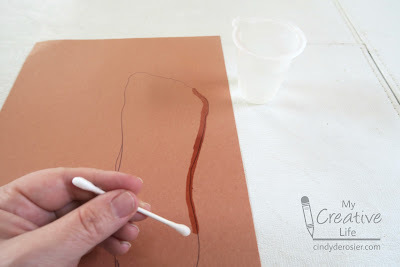 Give a gentle tug and the construction paper will separate along the wet line. Mine came out easily, but if yours gets stuck somewhere, just re-wet the area. Now cut two triangle ears and two oval eyelids from the brown. No need to draw them first - just draw the shape you want with the q-tip, then tear. 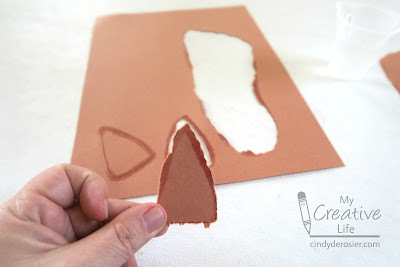 Make a large oval on the remaining brown construction paper and tear it out. This will be the horse's neck. Use the same q-tip technique to make two round eyes from white construction paper. 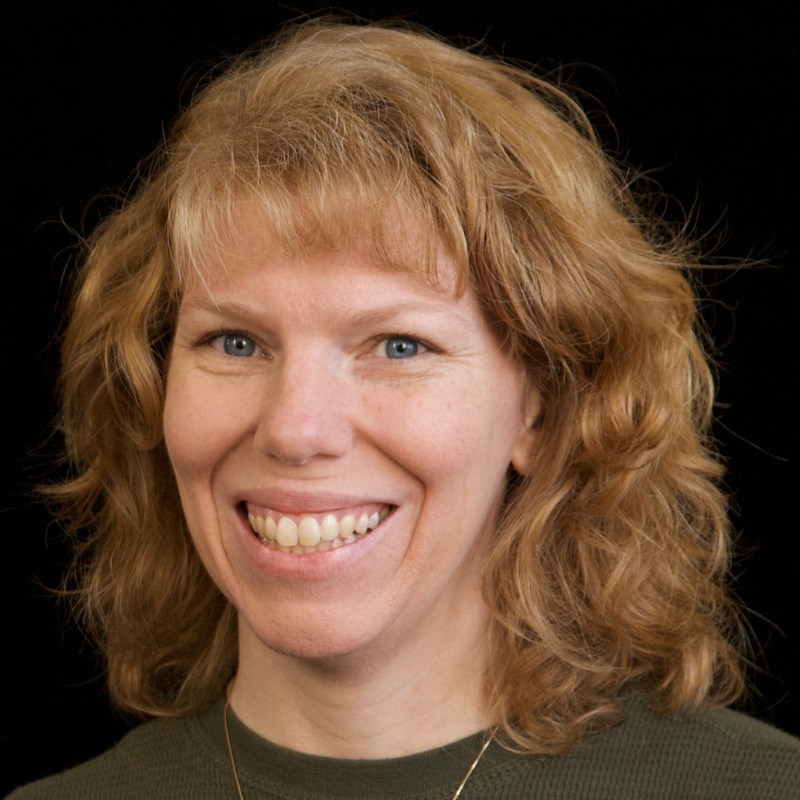 Then use black construction paper to make two pupils and two nostrils. 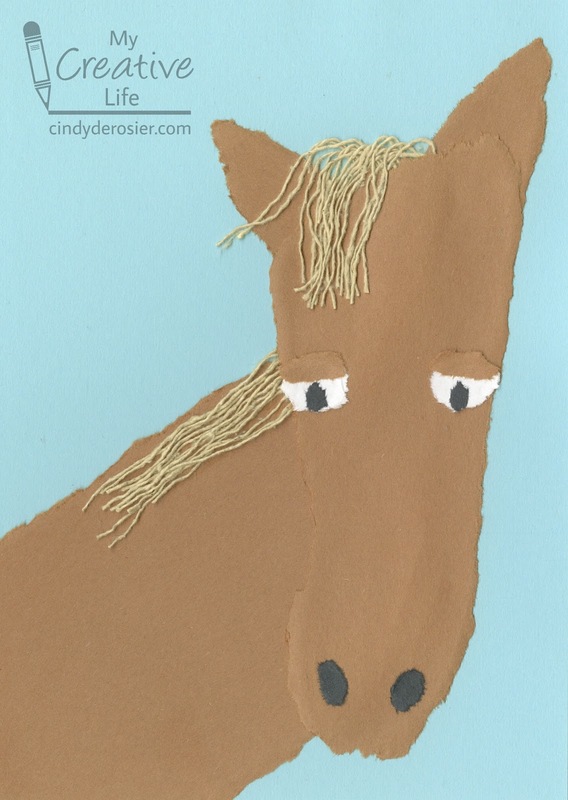 Cut lengths of twine about 4" long, then untwist them to make the horse's mane. Now assemble the pieces. 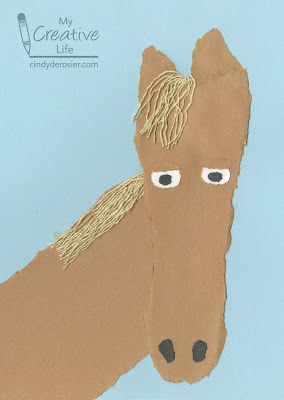 Glue the neck of the horse to a background paper, then add twine for the mane. 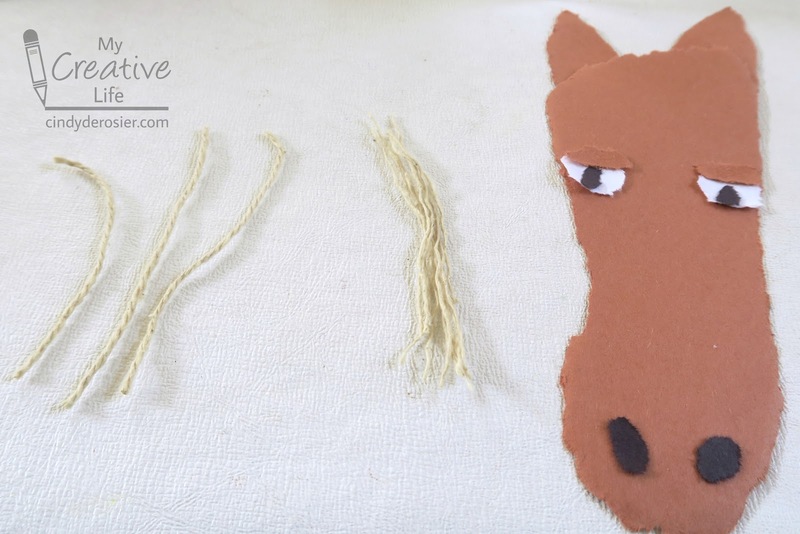 Glue the eyes, eyelids, nostrils, and ears to the horse's head, add a forelock of twine between the years, then glue the assembled head onto the neck. This is my horse. That's Trevor's at the top of the post. Have fun making your own torn paper footprint horse! This looks awesome! I love that it's a footprint!!!!!!!!!!! OhMiGoodness, this is so cute! Hehe...this turned out so cute!